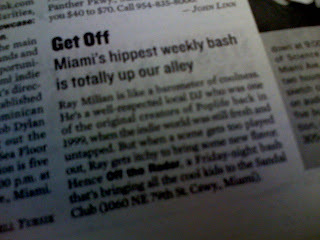 We got a little write up in the current issue of the Miami New Times (in stands now!)!! "Ray Milian is like a barometer of coolness. He’s a well-respected local DJ who was one of the original creators of Poplife back in 1999, when the indie world was still fresh and untapped. But when a scene gets too played out, Ray gets itchy to bring some new flavor. Hence Off the Radar, a Friday-night bash that’s bringing all the cool kids to the Sandal Club." Much love to Patrice for hooking it up and helping spread good music and good times! !